June is over, and July is in season! And I don’t know what it’s like for you, but here it’s nice and hot. The summer feels like it is truly in full swing now, and I’m in love with it. Summer might be hot, sticky, and full of mosquitos, but it holds a special place in my heart. There’s a sweetness to summer, a feeling that only this season can evoke. 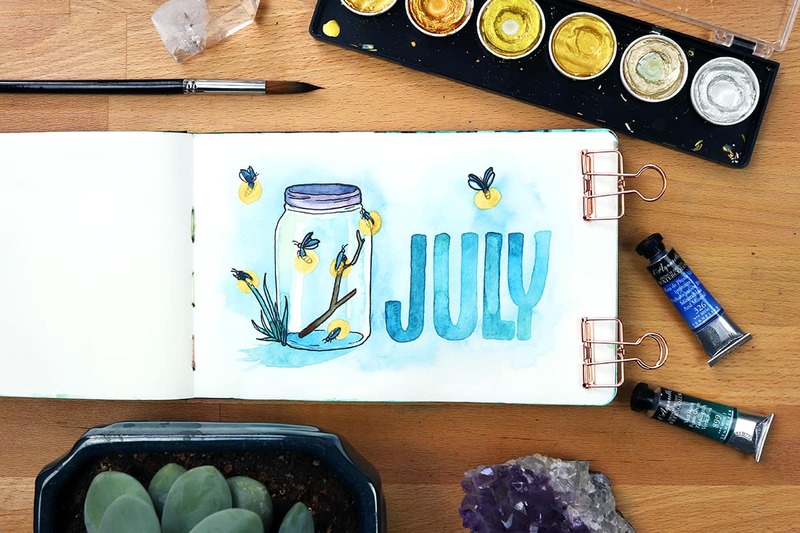 I wanted to capture that feeling in my July 2018 monthly set up. I can’t paint the smell of a summer rain, the song of cicadas in the warm evenings, or the feeling of a slight sunburn, but I can paint the alluring glow of nighttime fireflies. There’s a romance to their dance at dusk, and to me, there is nothing more summery. Ever since my March monthly setup, you’ve been asking me to do a tutorial on negative painting. I don’t have one quite yet (soon, though! ), but I did use this technique again in my July 2018 monthly setup. Let me walk you through the process really quick! The trick to negative painting is that you outline the shape of an object and fade that outline out to nothing. In my July spread, I’m outlining trees. In my March spread, I was outlining leaves. The concept is the same! Here I carved out the shape of a single tree, then blended the watercolors outward until the water runs clear, radiating away from the outline. That caused the area surrounding the tree to get darker, which means the next layer of trees will be darker. Progressively darkening each layer creates the illusion that the trees are fading into the distance. It makes more sense if you watch it in action, so make sure you go watch the video! One tip I have for you if you try this is to make sure that each layer dries completely before you move on to the next layer. If you get impatient waiting for the paint to dry, do what I do and force it to dry with a heat tool or a hairdryer. 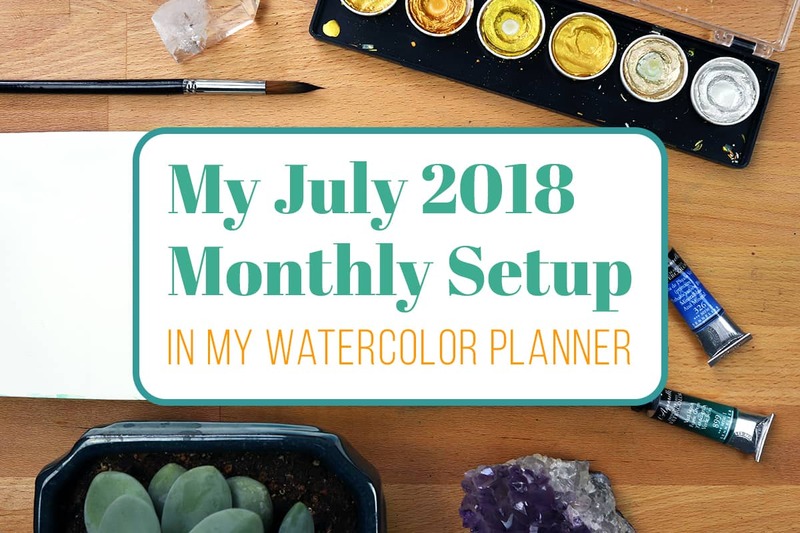 If you haven’t got a July 2018 monthly setup completed yet or you simply don’t want to go to the trouble of whipping one up, then I’ve got the perfect solution for you! 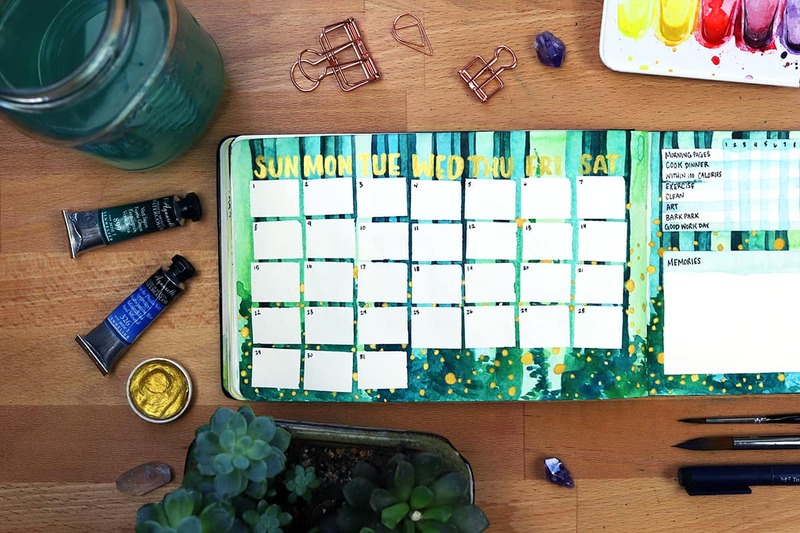 I recently created a free July 2018 calendar printable featuring the fireflies that I love so much! 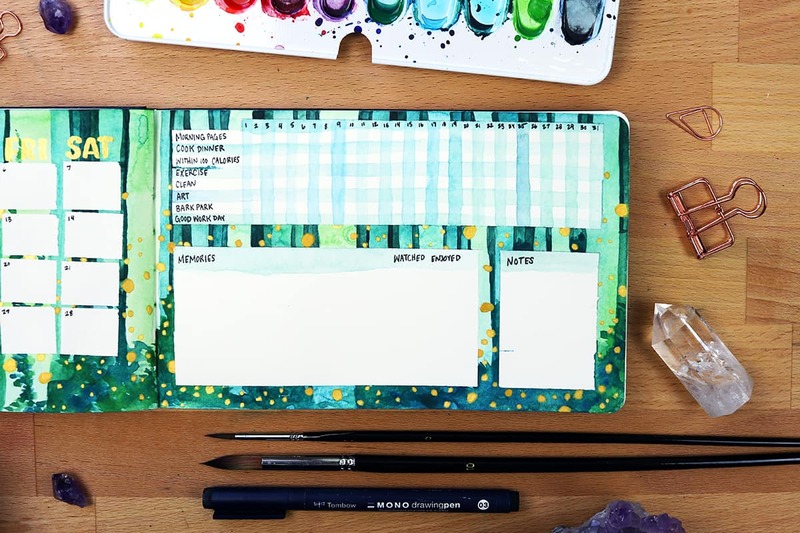 You can grab one for your A5 journal or your full-sized binder and make it fit perfectly in your existing planner. Head to this post to learn more about how to get your hands on this free printable! Make sure that you enjoy July while it’s here! You might not be thrilled about how hot it is, but try to remember that in six months’ time, you’ll be wishing it was summer. So soak it up, feel the heat, and allow yourself to enjoy the sensory feast that is midsummer. Thanks bunches Jessica!! I always love the look of it as well – the depth and dimension it ads is so fun. Thanks also for the printables you offer 🙂 In your Instagram you asked us to tell you what we like so here is my preference: I usually print out a classic Ryder Carroll-style monthly calendar (a line per day, top-down), stick a washi tape at the edge of my page (helps me to find my monthly pages) and write or draw some sort of title design. Thanks so much for your feedback Maria! You never know, it may be something that’s added in the future.